The PowerMAG Control software enables a quick and clear treatment setup. In addition to integrated standard protocols for depression or tinnitus treatment, custom protocols can be set up very easily using the intuitive user interface. 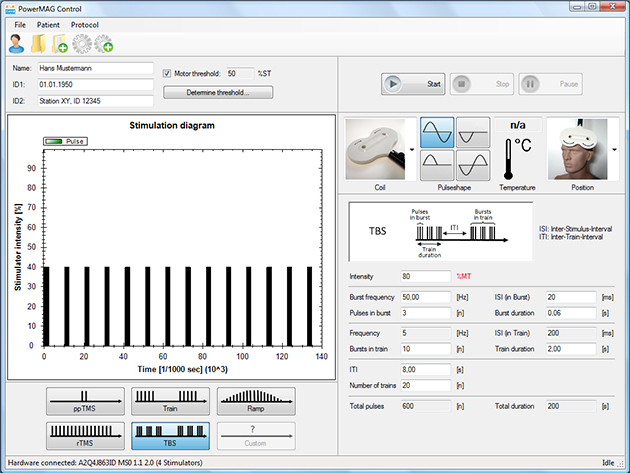 Settings such as the individual motor threshold, stimulation protocol and the stimulation location can be assigned to individual patients and saved. Free text fields allow you to enter additional information about the patient (such as medication). Calling up personalized settings is outstandingly helpful and time-saving during repeated therapy sessions, such as for the treatment of depression.